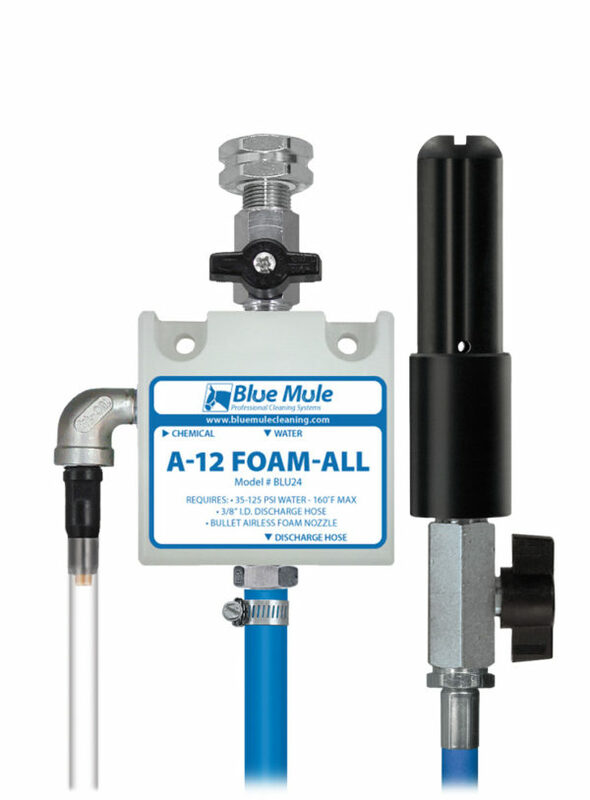 The 2-Hose Low Volume Foam-All is a combination applicator for applying one or two chemical products as wet, clinging foam. This venturi injection system uses city water pressure (35 - 125 PSI) to draw and blend chemical concentrates into the water streams to create accurately diluted solutions. 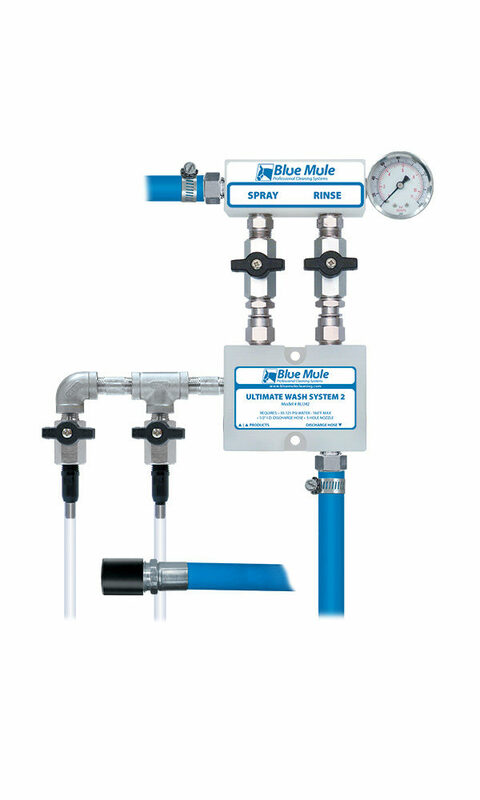 Precision metering tips are used to control chemical usage independently for each hose. The mixed solutions flows through the hoses to the "airless" foam wands which draw in atmospheric air to create and project foam in a fan pattern or narrow stream. Hoses can be used independently or simultaneously. 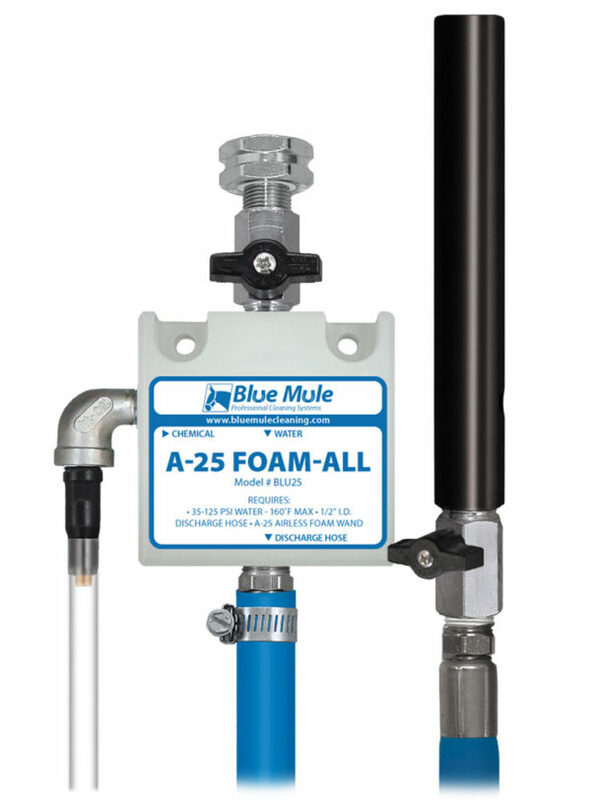 The Blue Mule A-25 Foam-All is a MEDIUM VOLUME foam applicator for diluting and applying foaming chemicals to any surface up close or at a distance. This venturi injection system draws chemical concentrate from any sized container, mixes it with water and projects the accurately diluted solution as a wet, clinging foam. The A-12 Foam-All includes a 50' hose and can be permanently mounted, hung or used anywhere 35-125 PSI water is available. It is ideal for cleaning jobs that will be done on a regular basis and is well-suited for multiple shampoo/chemical application duties around the house, stable, garage, vet clinic or kennel. The Blue Mule Rough Brush Foam-All is a foam cleaning system that continually creates foam through the stiff bristle brush. This venturi injection system draws chemical concentrate from any sized container, mixes it with water and projects the accurately diluted solution through the 50' hose and 44" handle as a wet, clinging foam. 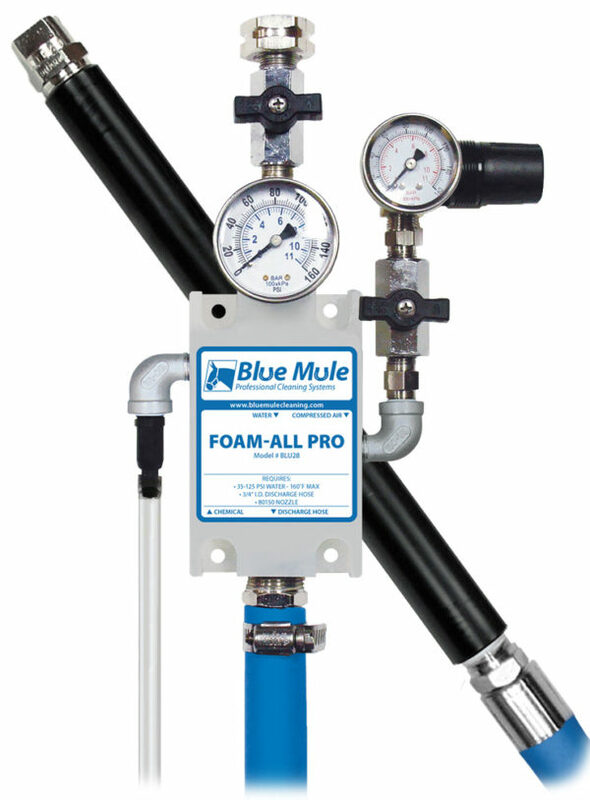 Mount the Rough Brush Foam-All anywhere 50-125 PSI water is available. Foam continually flushes debris from the bristles. Great for tough jobs that require scrubbing with an rough touch. The stiff bristled brush should not be used on paintwork or other delicate surfaces. 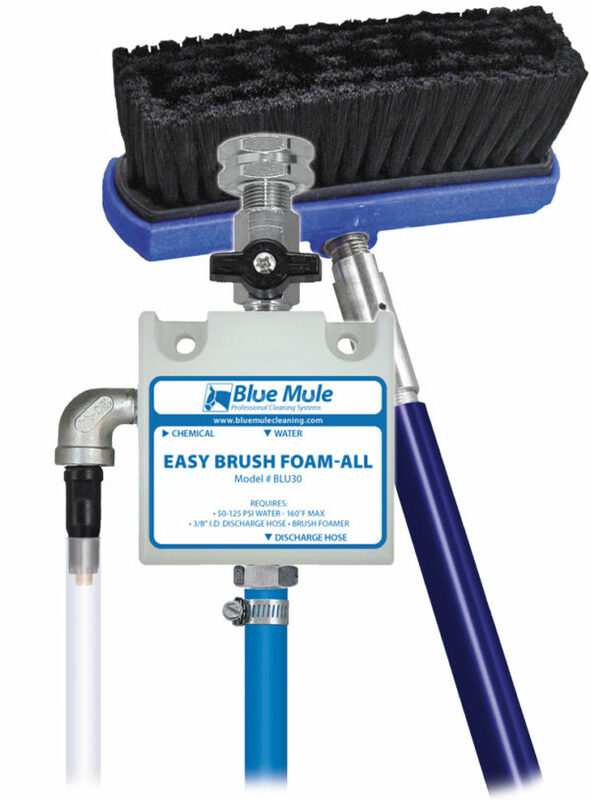 The Blue Mule Easy Brush Foam-All is a foam cleaning system that continually creates foam through the soft bristle brush. This venturi injection system draws chemical concentrate from any sized container, mixes it with water and projects the accurately diluted solution through the 50' hose and 44" handle as a wet, clinging foam. 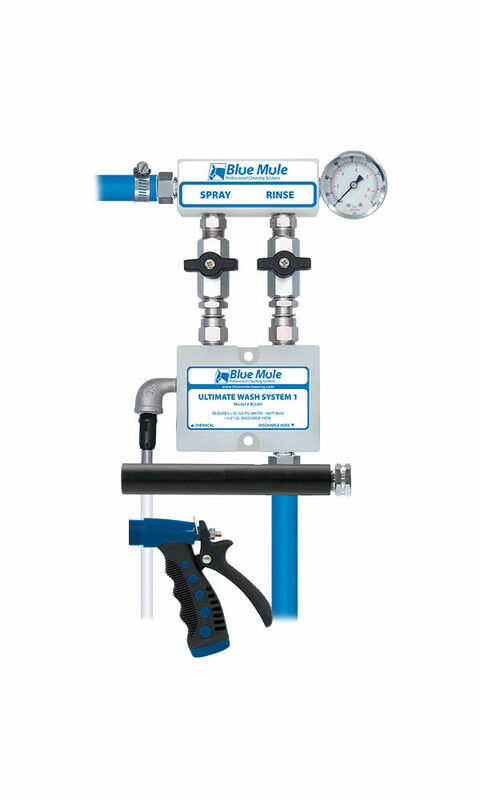 Mount the Easy Brush Foam-All anywhere 50-125 PSI water is available. Foam continually flushes debris from the bristles. Great for jobs that require scrubbing with a soft touch. The soft bristled brush is suitable for use on paintwork and other delicate surfaces. 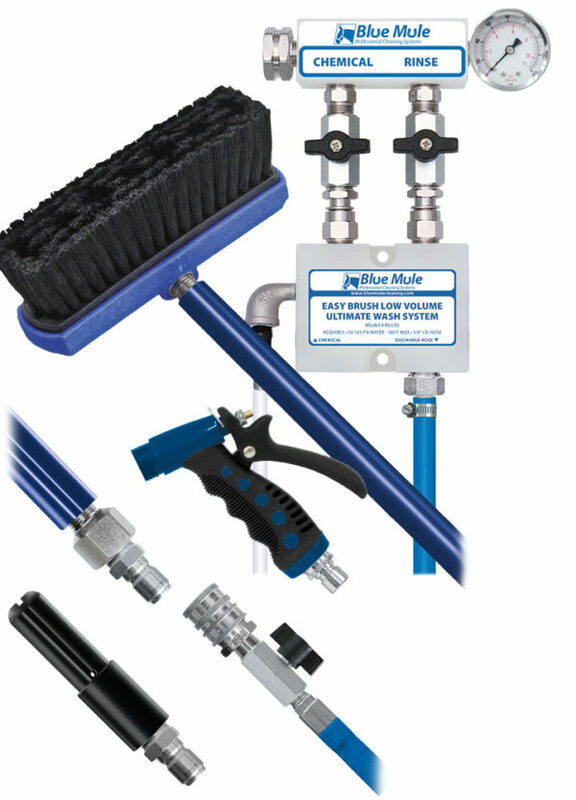 The Blue Mule Easy Brush Low Volume Ultimate Wash System is a foam and rinse station with multiple attachments. This venturi injection system draws chemical concentrate from any sized container, mixes it with water and projects the accurately diluted solution as wet clinging foam through a brush foamer, or an adjustable foam nozzle. Remove the quick connect foam brush or nozzle and adjust the ball valves to rinse using a spray gun. 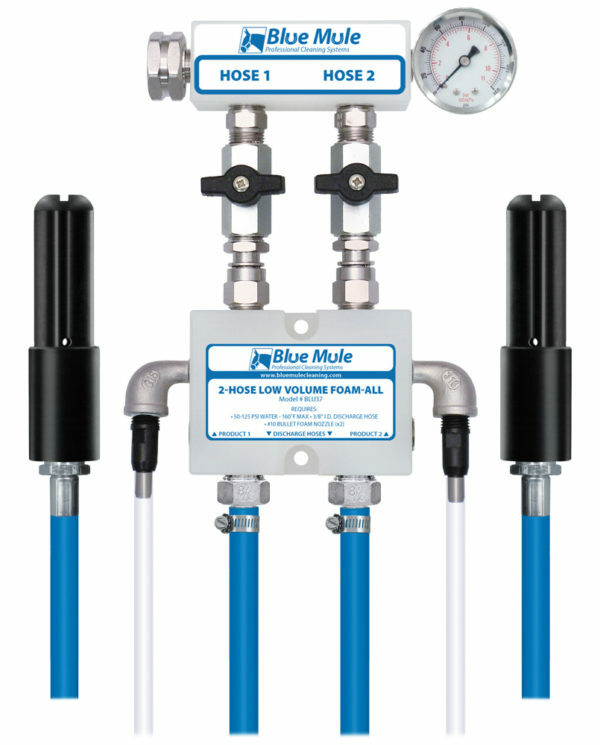 Mount anywhere 50-125 PSI water is available. Foam continually flushes debris from the bristles. Great for jobs that require scrubbing with a soft touch. The soft bristled brush is suitable for use on paintwork and other delicate surfaces. The Foam-All Pro is a professional LOW VOLUME foamer for applying foaming chemicals with minimal overspray. This venturi injection system uses standard city water pressure (35 -125 PSI) to draw and blend chemical concentrate into the water stream to create an accurately diluted solution. Rich, clinging foam is created by injecting compressed air into the solution to greatly increase volume and coverage ability. Foam is then projected through the discharge hose and fan nozzle onto any surface up close or at distances up to 9 feet. Gauges display incoming water and air pressure to assist with setup and optimize performance. The Ultimate Wash System 1 is a MEDIUM VOLUME wash & rinse system for applying one chemical as foam and rinsing through the same hose. This venturi injection system draws chemical concentrate from any container, mixes it with water, and projects the diluted solution through the 50' discharge hose. The foam wand draws in atmospheric air into the solution to create clinging, wet foam. Remove the foam wand and adjust the ball valves to rinse with clean water using just the garden hose gun. This heavy-duty system is designed to outperform and outlast the competition through superior design and materials. 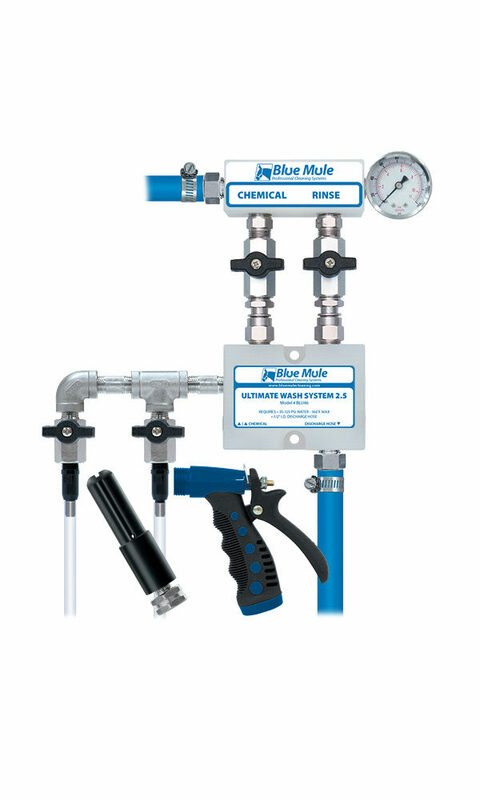 The Blue Mule Ultimate Wash System 2 is a wash & rinse system for applying 2 animal grooming products and rinsing through the same hose. This venturi injection system draws concentrated product from any sized container, mixes it with water and projects the accurately diluted solution through the fur-penetrating 5-hole nozzle. Use the ball valves to switch between products and simply close the chemical ball valve and open the rinse valve to spray fresh water. The Ultimate Wash System 2 is designed for animal bathing, but has countless other applications. This heavy-duty and easy-to-use system will outperform and outlast the competition through superior design and materials. 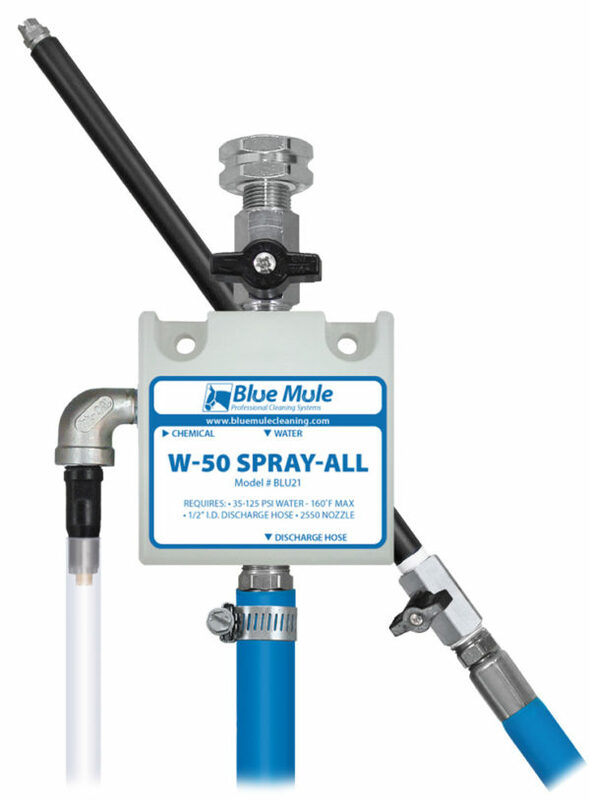 The Blue Mule Ultimate Wash System 2.5 is a LOW VOLUME wash system for diluting and applying 1 or 2 chemicals as foam or spray, and for rinsing. This venturi injection system draws concentrated chemical from any sized container, mixes it with water and projects the accurately diluted solution through the discharge hose. Use the ball valves to switch between products or dilution ratios and simply close the chemical ball valve and open the rinse valve to spray fresh water. Use the foam nozzle to apply wet, clinging foam or remove the nozzle and spray chemical and rinse using only the garden hose gun. This heavy-duty and easy-to-use system will outperform and outlast the competition through superior design and materials.